The Commercial Bank of Ceylon was recently honoured for its compliance with the requirements of the Employees Trust Fund (ETF). 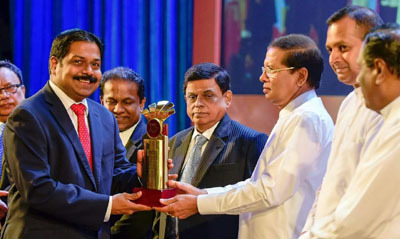 President Maithripala Sirisena presented the bank with the Gold award in the Large category at the 35th anniversary celebrations of the ETF in recognition of its unblemished record of continuous payments to the fund on the due dates between 2001 and 2015. The selection criteria for the award also considered factors such as submission of required documentation such as half-year returns to ETF on time and overall commitment to compliance with regulations. Commercial Bank’s Executive Director/Chief Operating Officer S. Renganathan accepted the award on behalf of the bank.